Coal Ridge Titan Paige Harlow (6) tips the ball over the net while Aspen High School Skier Tate Randel (6) reaches for the block during Thursday night's game. NEW CASTLE — Trailing 23-20 in the fourth set and on the verge of defeat for the first time in the 2017 season, the Coal Ridge Titans volleyball team dug deep and roared back for a thrilling five-set win on homecoming over the visiting Aspen Skiers Thursday night in New Castle by scores of 23-25, 25-21, 22-25, 25-23 and 15-7. In the matchup of No. 1 and No. 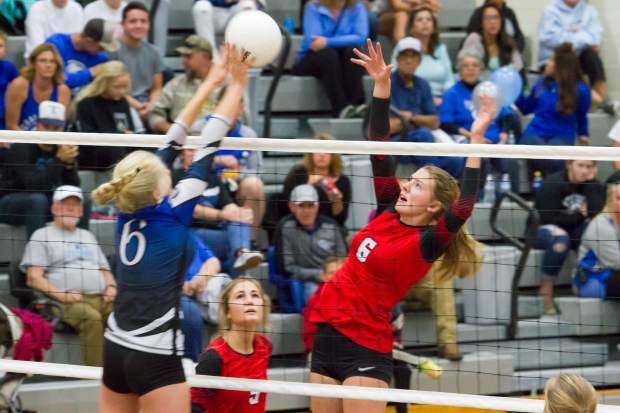 2 in the 3A Western Slope League, the two teams fought hard in front of a packed house at Coal Ridge High School, but it ultimately came down to high-level experience and leadership on the part of the Titans on a night where nothing came easy. Fortunately for the Titans, they had standout senior Paige Harlow on their side of the net. In her final homecoming game in New Castle, the senior middle hitter responded with the best night of her varsity career, recording an astonishing 24 kills to pace the Titan attack, including in the final two sets, where she helped power the Titans to the comeback win. Outside of her terrific play in the middle, it was her emotion and intensity that seemed to push the Titans forward. Although the Titans ultimately came out on the right side of things, it looked bleak early on in the big matchup as the Skiers took the first set on a missed call. Following traded volleys, the Titans came through with what looked to be a kill from Harlow as Aspen’s Mary Williams appeared to be late getting to the ball for a dig. But as the ball skipped off the ground and hit Williams’ hand, the ball sailed back over the net as the Titans celebrated what looked to be a go-ahead kill. Unfortunately, both umpires and the line judges missed the call, giving Aspen the point, leading to a two-point win for the Skiers. After dropping the first set in disappointing fashion, the Titans roared back jumping out to a 10-4 lead in the second set behind kills from Harlow, senior Cassie Greene and junior Alexis Wiescamp, as well as an ace from Greene. Holding the six-point lead, the Titans continued to roll as Harlow stood tall, recording three more kills to give the Titans a 20-14 lead, but the Skiers didn’t go quietly, coming back to get to within three at 24-21 before a kill from freshman Taylor Wiescamp closed out the win for the Titans, knotting things at 1-1. In the third set, it looked to be all Coal Ridge as the Titans held the lead throughout the match, at one point up 17-13. But the Skiers continued to fight, coming all the way back to tie the third set at 18-all before an ace from Gaia Murphy and a long volley from the Titans on set-point gave the Skiers a stunning 25-22 win, setting up a pivotal fourth set in New Castle. For the first time on the season, the Titans were locked in a fight, and in the start of the fourth set Coal Ridge came out slow as the Skiers raced out to a 5-1 lead. Following a timeout by Titan head coach Aimee Gerber, Coal Ridge seemed to find its footing, coming back to tie the set at 7-all, which led to the Titans taking a 15-13 lead thanks to a block from junior Kenzie Crawford and a tip from the junior setter, which sparked the Titans. But Aspen didn’t back down despite the building momentum against them as Williams picked up a big kill late in the set to give the Skiers a 19-18 lead. The Skiers then extended the lead to 23-20, setting up Coal Ridge’s heroics. Harlow and Taylor Wiescamp came through with huge kills, while Harlow added a perfectly placed tip to tie the set at 23-23. Harlow then picked up a thunderous ace to give the Titans the lead before a net violation on Aspen gave the Titans the come-from-behind 25-23 win, forcing a fifth set. Riding the wave of momentum built up at the end of the fourth set, it was all Coal Ridge in the final set as a kill from Alexis Wiescamp, three from Harlow and one impressive one from Greene gave the Titans a 14-7 lead before an ace from Crawford gave the Titans the thrilling five set win to stay undefeated on the season. Along with Harlow’s 24 kills, Greene came through with a great night as well, recording nine kills. Crawford dished out 39 assists and 12 digs for the Titans, while seniors Emily Wright and Santana Martinez were superb defensively, recording 14 and 12 digs, respectively. Sitting at 7-0 (4-0 3A WSL) on the season, the Titans will host the Delta Panthers Tuesday at 6:30 p.m. Aspen fell to 6-1 overall and will next play Tuesday at Moffat County.